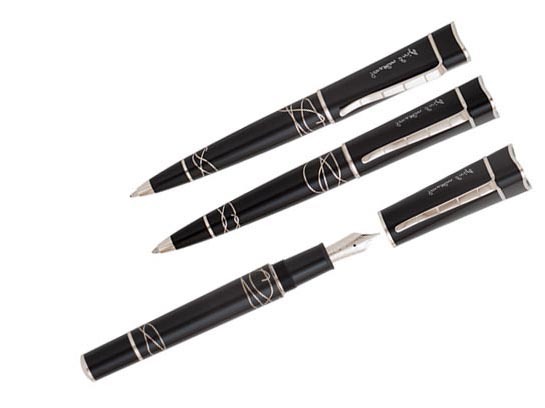 Montblanc presents the Limited Writers Edition 2012 honouring Jonathan Swift, an Irish writer who is probably the foremost prose satirist in the English language. His most famous book, *Gulliver’s Travels*, was published in 1726, in which he describes Gulliver*s travel to different countries, reflecting his political experiences and belittling the mannerism of the English prevalent class. The cap is made of precious black resin in a triangular shape and engraved with Jonathan Swift*s signature and shaped like Gulliver*s tricorn hat, a typical tradesman hat of the early 18th century. The barrel features multi-layered inlays in black precious lacquer with ropes rapped around the barrel, reminiscent of Gulliver being captured at the shore of Lilliput Island. The clip depicts a staircase that the mayor of Lilliput had to climb to be able to talk to the giant Gulliver. The rhodium-plated 18kt gold nib is engraved with the giant Gulliver and the Imperial Army, available in M, F and B widths. Piston Fill.